Have been noticing the wavy design of the new Botanic Garden overhead bridge spans across 2 major roads, the Bukit Timah Road and Dunearn Road. 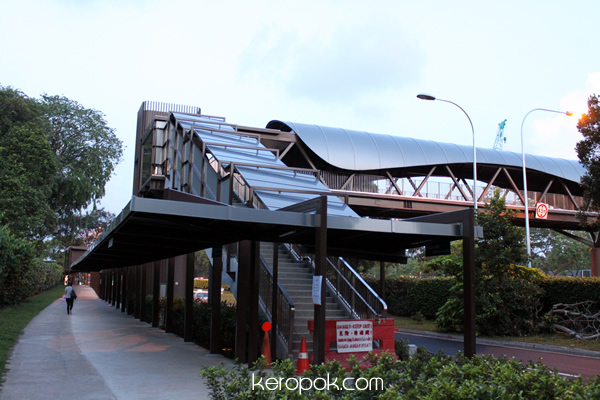 It connects to the new Botanic Garden MRT Station that will open in October 2011. The wavy design catches the eye. Probably the nicer one along Bukit Timah Road! A notice on the bridge says it will open in a few days time. I think it's either the 3 or 11 September, I forgot to write it down or take a photo of it. For old folks and parents with children on prams, who can't climb the stairs, this overhead bridge has a lift at both ends. (Finally, they are listening and installing new overhead bridges that will make people use it). Free Island Admission on Sentosa Day! H&M Singapore First Day Queue.